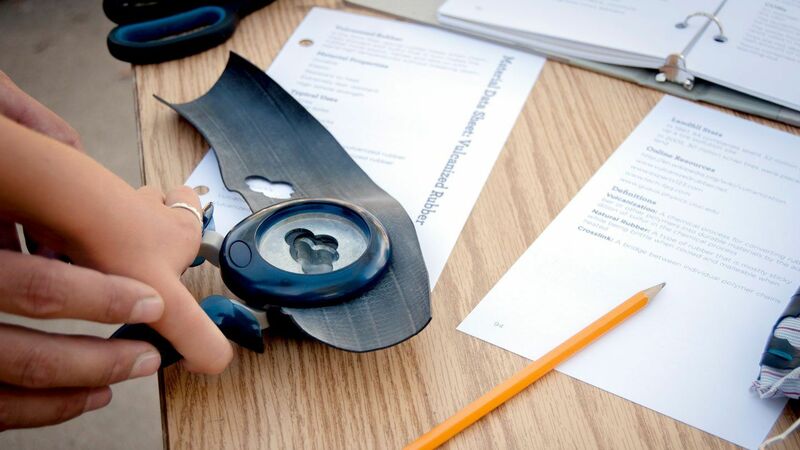 Upcycling happens in a makerspace when design thinking meets hard-to-recycle junk. Inspire students to design and create cool, useful products from trash otherwise destined for landfill. You've read about the maker movement. You've seen the posts with 3D printers, laser cutters, and three-axis mills in shiny new labs. And you want your students to start making, too. But you've got one big problem: you don't have a full lab -- or even a 3D printer -- because, like many educators, you don't have the biggest budget. Maybe you have no budget at all. But what if you could get started making tomorrow and didn't need all the fancy tools to join this movement? Making starts with a mindset, and simple materials are all that you need to get started. There are resources all around you, materials hidden in plain sight, tools just waiting to be used for a creative purpose. And with a little dose of ingenuity, you'll have your students making in no time. One perfect way start making on the cheap is through upcycling, the intentional transformation of hard-to-recycle materials into new products, thus saving them from the landfill. This type of real-world project not only teaches making skills but also helps you integrate making into your subject area. Study material science, explore industrial design, or dig into environmental education. As an added bonus, a project like this ignites your students' entrepreneurial spirit. Here's the five-step strategy that I've used to get my students making products out of hard-to-recycle materials. These steps could be done in one class period each, but if you want more time for ideas and iteration, feel free to expand the timeline as you go. Expect a beautiful mess, a bit of chaos, and a lot of fun as your students start to save the landfills -- by design. You can gather your own materials or, as I prefer, have your students source their own. I find that bike tubes, fabric scraps, sewing supplies, scissors, craft punches, glue, staples, and cardboard are easiest to work with, but feel free to use other materials. For example, old fire hoses from the local fire station, flat tubes from the bike shop, old wetsuits, bottle caps, and corks are all very workable materials. Have your students use these material property sheets or this EPA site on common waste materials as a background research project while they are collecting supplies. If you want to go even deeper into the waste bin, check out Garbology by Edward Humes to see the journey of our trash. Check out this Brainstorming at the d.school video. I've created a set of printable Create Cards. Each student lays down a card from three different areas -- materials, location, and action -- and then students brainstorm products based on that combination. Refine the idea. Once they have some ideas, I like to use the 635 Method to help refine each idea. Here's the messy fun step where your students get to make one of their best ideas. It won't (and shouldn't) be pretty at first. Help them take risks, cut it too short, try again, get advice, and have no fear of "doing it wrong," because there's no wrong when we prototype. If they're still at a loss, direct them to some upcycling sites like Uncommon Goods, Green Guru, or Alchemy for inspiration. This can be done over multiple class periods or just one, depending how far you want to take the iterative process. No one wants to fail, but "fail" isn't a bad word. It's a good word representing a necessary part of the process. Building a mindset is one of best things to focus on, so help your student feel comfortable with failures that lead to success. Like all maker activities, upcycling isn't about pretty end results. It's about the process. Help students fail fast, learn from it, iterate, and try it again. Have them ask friends for help and give them thoughts when needed. Even better, tell them that you don't know either (gasp! ), but that you can both try learning together. Overall, have fun and be creative. And make sure to leave at least ten minutes for cleanup at the end of each class! This final step can be skipped if you run out of time, but it's a great way to celebrate student efforts and even take a product to market. The gist is showing and telling their product idea with a short elevator pitch presentation. The best product (such as my students' bike tube wallet) can then be selected and manufactured for sale in your school or community. To take it even farther, have your students start to think like a startup and evaluate their idea using a Business Model Canvas (PDF) -- an alternative to a business plan. If you still have time and want to go even deeper download a free upcycling curriculum with a bunch more ideas for getting your students making through upcycling. Please share your own upcycling experiences in the comments section below.